Put gelatin powder in a bowl with 1-2 tablespoons lukewarm water. Mix, and let the gelatin swell slightly. For the raspberry jam, mix raspberries, sugar and lemon, and mash it with a fork. For best results, use a hand mixer and blend until you get a smooth puree. Put the mixture in a saucepan, and bring it to a boil. Let it cook for a couple of minutes, so that some of the water in the berries evaporates. Remove the pan from the heat and add the gelatin mixture. (You can use pectin instead of gelatin. Read on the package how much to use.) Stir well and leave to cool. 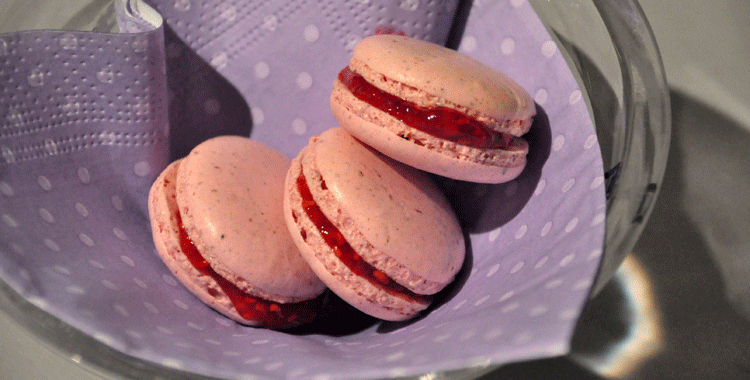 When the jam has turned thick (after some time in the fridge), you can start sandwich the macarons. Use a teaspoon, a knife or a piping bag, whichever you prefer: turn a macaron upside down, add 1/2-1 teaspoon of jam, and press the bottom of another macaron on top of it.